Kinder Morgan Inc. is facing a cost overrun for its Trans Mountain pipeline expansion, heaping more uncertainty on a project already threatened by legal challenges and a growing trade battle between Alberta and British Columbia. The price tag has climbed above the $7.4-billion figure cited by the company, industry and government sources familiar with the project said, although the magnitude of the overrun is not known. The Houston-based company has said it won’t update its cost estimate for the contentious expansion even as construction delays stack up and it seeks a deal with the federal Liberal government by May 31 to salvage the project. 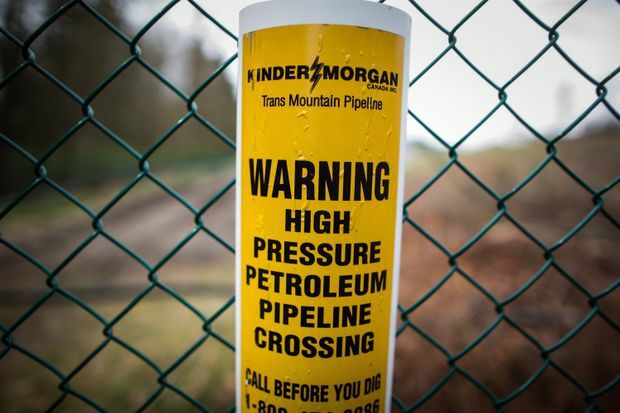 A sign warns of an underground petroleum pipeline at Kinder Morgan's facility in Burnaby, B.C. Rising costs stand to crimp financial returns and could lead to higher shipping fees, known as tolls, for cost-conscious oil-sands producers, reducing the appeal of the project. Kinder Morgan declined comment on the project cost or the status of negotiations with Ottawa. The company in April halted non-essential spending and said it would ditch the project by June 1 without assurances that it can complete construction through B.C. It is also seeking protections for shareholders against further delays. The company won two legal victories Thursday, with the B.C. Supreme Court dismissing separate petitions by the Squamish Nation and the City of Vancouver that sought to overturn provincial environmental approvals. The Federal Court of Appeal has yet to rule on a separate challenge. Read More: B.C. Supreme Court ruling on pipeline. This month, Ottawa pledged to cover financial losses sustained by the company – or any other investor in the project – if the B.C. government obstructs the expansion. Finance Minister Bill Morneau has yet to explain how such an indemnity would work or what it might cost, only that it would function as insurance against political risk faced by a project the federal Liberals insist remains commercial. The Minister is scheduled to address a business crowd in Calgary on Wednesday. A federal government insider, who was not allowed to speak on the record, said it was only natural that the pipeline costs will grow over time as Kinder Morgan falls behind schedule, but argued the project remains viable and profitable. The official said it is understandable that Kinder Morgan is nervous about the B.C. NDP actions to stall the project just when the construction costs are expected to grow from $15-million to at least $150-million a month if Kinder Morgan resumes active construction. However, the insider said Ottawa has seen the company’s books that show the “rate of return is healthy” and remains convinced the project will be built. Major oil sands producers argue the plan to nearly triple capacity on the existing Alberta-to-B.C. pipeline to 890,000 barrels a day would help ease price discounts that have plagued the industry for years. But the project has seen costs leap from an initial price tag of $5.4-billion to $6.8-billion. Kinder Morgan hiked its estimate again last year to $7.4-billion, citing conditions imposed by the National Energy Board and other design changes. Higher project costs have already led to increased shipping fees for oil producers. Last year, shipping commitments made by companies under long-term contracts dipped by 22,000 barrels a day or 3 per cent, although those commitments were taken up swiftly by other oil producers. Shippers could balk at further increases, but they are unlikely to renege on transportation deals so long as rival pipelines remain bogged down and the benefits of tapping new markets outweigh the costs, said RS Energy Group analyst Samir Kayande in Calgary. “From a producer’s standpoint, it hurts, but at least they get a market for their oil,” he said by phone.